Today we went to the Pitsonyane school which was about 50km outside of Gaborone. The day was a success and we built on the good work of Day 3 by successfully using the same skills sessions from the day before along with incorporating the ABC messages that the kids had been taught at the school into the warm-ups, skills sessions and final lesson. Those early risers among us took a trip to a local private school after breakfast and this was a good contrast to the public school at Pitsonyane (which was itself a big step up from the Gamodubu trust yesterday). 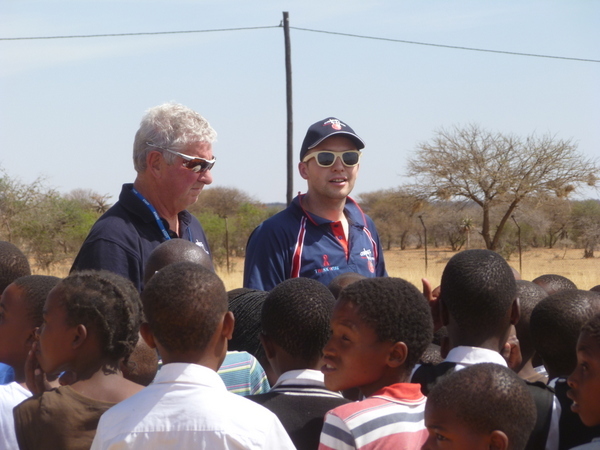 We then played a bit of backyard cricket with our two drivers/teachers before setting off for the school in the minibus. I had fun with the open window blowing wind in my face, David ‘Sloth’ Boothroyd had a snooze, Scott jizzed out suntan lotion and Ian described to us all the workings of ‘Ceroc’ dancing, a sort of Latin Salsa that claims to be ‘the best entertainment you can have mid-week’. Some roadside baboons were spotted as well as a fried chicken establishment called ‘Chicken Licken’. Arriving at the school we quickly got into things, with Graham’s warm-up a great example of how to teach the HIV/AIDs message in a fun and simple way. 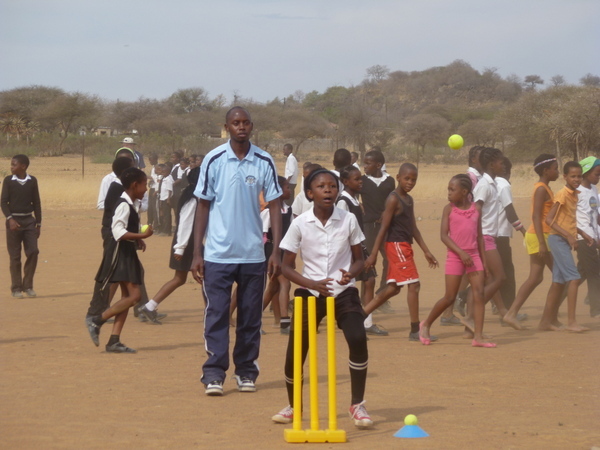 We had about 130 kids today, approximately 55% male and possibly 15% having played cricket before. For the warm up all of the kids all take turns throwing around a number of tennis balls in a big area, with the coaches helping. A red ball is then introduced, as well as a few kids being provided with a glove to wear. The purpose of these elements is to show them that the red ball is the HIV/AIDS virus, and that the only ones who touched the red ball and be safe were those wearing the gloves (the ‘protection’). We then split into four groups as per the day before, and while we only had two hours, the team managed to get the four groups of 25-40 into each skill session. 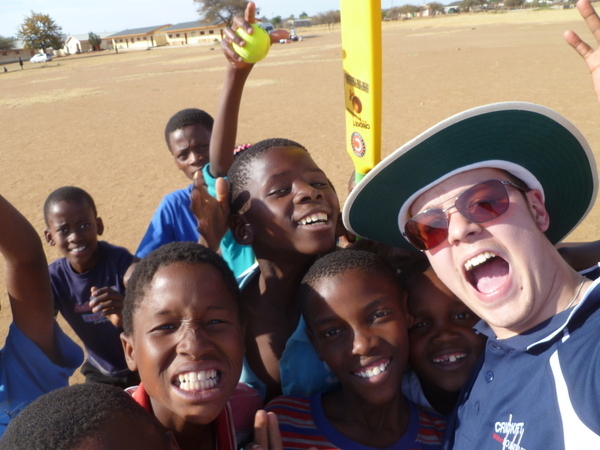 I think although we could have timed the sessions a bit better, the day as a whole worked well, and pretty much every participant had a go at batting, bowling, fielding and catching. By the end of the afternoon, the children were all shouting ‘Abstain’, ‘Be faithful’ and ‘Condom’, and we all agreed after dinner that the messages were delivered successfully. A few tweaks are going to be made to our coaching formula for tomorrow (mostly to deal with giving all four groups a fair amount of time to learn the skills/messages properly) but we are only on day 4 and I’m sure by the end of the trip we will have a well-oiled Cricket Without Boundaries machine in operation. However the #notsoinvincible Gaffe of the Day award today goes to myself as the graze on my left shin is rather glorious. Tomorrow we are setting off early doors for some coach-education before another afternoon of coaching. And to think I missed the opportunity to salsa with Ian…..
A fat match?!?! That’s my cousin you’re talkin about!